Die Naturwissenschaften was founded in 1913 by Arnold Berliner and published by Julius Springer Verlag. Berliner intended to create a German equivalent to the English-language journal Nature. The original subtitle Wochenschrift für die Fortschritte der Naturwissenschaften, der Medizin und der Technik (Weekly Publication of the Advances in the Natural Sciences, Medicine and Technology) was later changed to its current The Science of Nature. The journal is published monthly and the articles are exclusively in English, after a gradual transition from German to English during the 1990s. 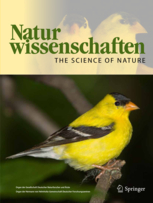 In January 2015, the journal changed its name to The Science of Nature. ^ Thatje, Sven (2012). "Introducing the Arnold Berliner Award". Naturwissenschaften. 99 (9): 675–676. doi:10.1007/s00114-012-0958-5. ^ Hentschel, Klaus (1996). Physics and National Socialism: An Anthology of Primary Sources. Basel: Birkhäuser. pp. Appendix E. ISBN 978-0-8176-5312-5. ^ Thatje, Sven (30 January 2016). "The Science of Nature – a new era, a new name for Naturwissenschaften". The Science of Nature. 102 (6): 1255. doi:10.1007/s00114-014-1255-2. PMID 25633936.